Travelling with cigars is not as straightforward as it sounds; we are not talking about just grabbing a few Havana’s and stuffing them in your pocket like some pocket change. Without storing your cigars in an appropriately humid condition (which is thought to be a humidity level between 65%-70%), they start to lose their flavor as they begin to dry up. Here’s where cigar humidors come in. Whether you are planning a weekend getaway or a much lengthier business trip, you would need one of the best travel humidor to retain the authentic taste of your cigars. For hundreds of years, cigar aficionados have relied on cigar humidors to preserve the flavor and aroma of cigars. That said, finding the perfect travel humidor is not an easy task since there is a handful of factors to consider and multiple options to choose from. Just to make your decision easier, we have compiled a list the best travel cases for cigar. Check them out to see which suits you the best. Before we start discussing the which travel humidor you can buy, we must briefly explain why you would need one in the first place. A humidor is an essential cigar accessory you should buy to keep your Smokey as fresh as the day you bought them. To maintain their genuine flavor, cigars need to be stored in a befittingly humid environment. Tobaccos are endemic to tropical regions, and if you are a cigar lover living outside the sun-kissed shores of the tropic, you would need to resort to a simulated arrangement to ensure the appeasing puffs you deserve from your smoking treasure. Humidors recreate the native humid condition of tobaccos and keep your cigars smoke ready all the time. If you travel frequently and have a regular urge for nice smoke, you should use one of the best portable humidors to carry your cigars along. Even if you are not much of a traveler, a humidor will prove quite useful to you since it gives you the perfect moist required for keeping your cigars in top notch condition. Many cigar aficionados argue that just like wine, cigars get better as they age and a proper humidor is necessary to retain the majestic ingenuity of your cigars. The size does matter when it comes to choosing the perfect travel humidor for you. Make sure the humidor you are willing to buy has ample space to store the number of cigars you want to store. Cigar humidors come in various sizes and shapes; some are as big as a giant room, and some are compact enough to carry around in your pocket. Room humidors are used by cigar collectors or distributors who need to store thousands of dozens of cigars for a substantial period. We are talking about more personalized versions here, which are small enough to be carried along wherever you go but how small should you go for? Or should you just pick a bigger portable version? In case of smaller humidors, you would have to stuff your cigars which, in turn, would compromise the flavor of the cigars because the humidor wouldn’t be able to allow ambient air supply to facilitate the aging process of the cigars. Larger humidors, on the other hand, could lead to a case of “humidity overdose’’! We did say that humidity is good for preserving cigars, but exposure to excessive moisture could dampen the cigars. Damp cigars cause uneven burn in cigars, meaning different parts of the cigar would burn in different rates; this phenomenon is also termed as “tunneling.” Dampening also brings about unwanted swelling in the tobacco leaves used in cigars, which makes them difficult to smoke. So, just pick the size you would need to store the exact amount of cigars you intend to store. Many customers might highly rate a specific humidor model as one of the best travel humidors, but if the size is not right for you, then it will do you no good. 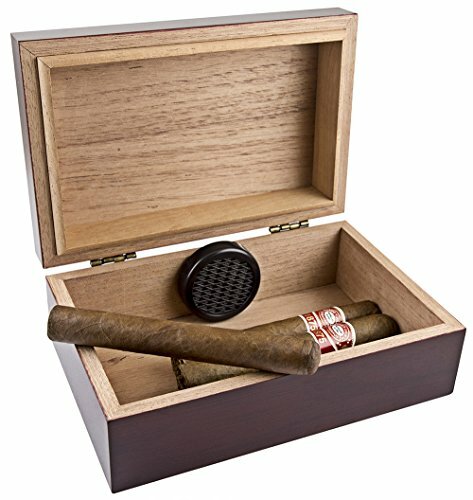 Since we are talking about best travel cigar cases, portability should be one of the most crucial factors to keep in mind while you are shopping for humidors. Needless to say, a travel humidor is a must have if you are a frequent traveler but even if you are not, it would be a wise investment to make for any cigar enthusiasts. The best potable humidors should be relatively smaller and lighter so that they could be easily put aside in your backpack or pocket while you are out on your roadside adventures. Always try to maintain an optimal balance between size and portability; don’t over-compromise the size when buying a travel humidor. Portability is vastly essential but what good would it be if you can’t store the right amount of cigars in it? In such cases, you should also look at the materials that are being used to design the humidor, go for lighter components if they are stable enough. You would find the travel humidors to be a bit more affordable than other size humidors because of their compactness and subtlety. On an average basis, you can carry up to a few dozen cigars in a typical travel humidor, which should be sufficient to accompany you on your trips. We would even recommend buying a travel humidor even if you have a larger humidor. We all have a craving for a lazy puff now and then; wouldn’t it be great just to take out the humidor from your pocket and put one in your mouth instead of having to walk to your humidor? If the seal in a humidor is flawed, no matter how frequently you fill up the humidor you won’t be able to retain the target level humidity, which ideally lies between 65%-70%. The perfect travel cigar case boast an airtight sealing system that recreates the exact humid condition required for cigars to sustain their ingenuity. Before buying a travel humidor, always remember to check the seal carefully. Here’s a simple method to test the seal of any humidors-first, take the humidor and close the lid. Next, take a dollar bill, any dollar bill would suffice, and try to slide it between the closed lid and the base of the humidor. If you can’t slide it past the crack than the seal of the humidor is in excellent condition with fantastic insulation properties. Conversely, if the bill could be easily slid into the humidor or can be easily pulled out of the crack, the seal must be in a very poor state. Good travel humidors are usually made of Spanish cedar, which is also a favorite building material for other humidors. Spanish cedar is a premium wood, not to be confused with the cedar used for making souvenir and closet linings, which offers outstanding insulation and a charming aroma. Spanish cedar is also known for enhanced durability as it expands and contracts over time to prevent cracking. But Spanish cedar is an expensive option to look at, and if a Spanish cedar humidor is out of your price range, you could opt for maple, mahogany, oak and cherry wood humidors. A hygrometer and a thermometer are commonly used together with cigar humidors. A thermometer, which I’m pretty sure we all are familiar with, is a commonly used tool that measures temperature. Hygrometer, which is not a common sight in households, is a device that is used to measure humidity levels. Some travel humidor models have these devices built in, but you can also buy them separately if you insist. 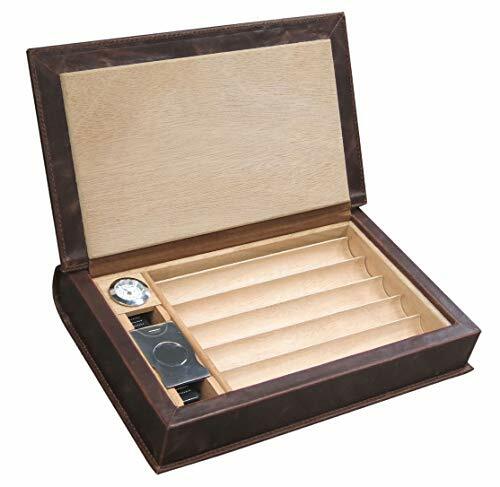 We prefer the travel humidor models which conveniently incorporates a hygrometer and a thermometer into its design. Built-in thermometers and hygrometers allows you to monitor the temperature and humidity levels regularly so that you can remain assured that your cigars are in perfect condition. 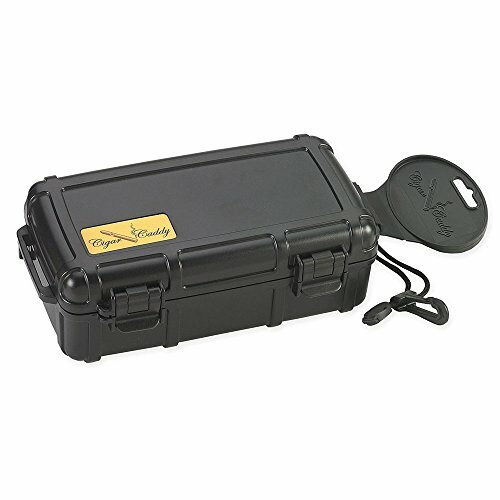 Cigar Caddy 3240 is the perfect travel humidor made for avid travelers and outdoorsmen who refuse to sacrifice the safety of their cigars during their excursions. This conveniently compact model is built with virtually impenetrable ABS molded plastic and features an airtight seal to bring us a humidor that can float on water and remains unaffected by water down to a hundred feet. The cushioned interior of this humidor has a humidification disc which can hold 10 Churchill cigars in a smoke ready condition. Designed to protect your cigars from abrupt exposure to environmental forces, the interior of this humidor also features two separate detachable foam pads, each capable of holding 5 cigars at a time. The pads make sure the cigars stay in place regardless of the terrain’s roughness; you can even expand the interior space by removing them whenever you want. The inclusion of a lanyard further adds to the versatility of this model. Home, out in the wild, or en route to your destination-wherever you are the Cigar Caddy 3240 10-Cigar Waterproof Travel Humidor has got your covered, making it in an ideal candidate for being named as one of the best humidor for travel. Going fishing? Mountaineering? Worried that your prized smokes might get withered out in the harshness of Mother Nature? Xikar’s travel humidors have been made to keep your cigar concerns away, allowing you to focus entirely on your outdoor pursuits. Xikar travel humidors are water resistant, airtight and are made of tenacious ABS mold plastic, which makes them crushproof as well. 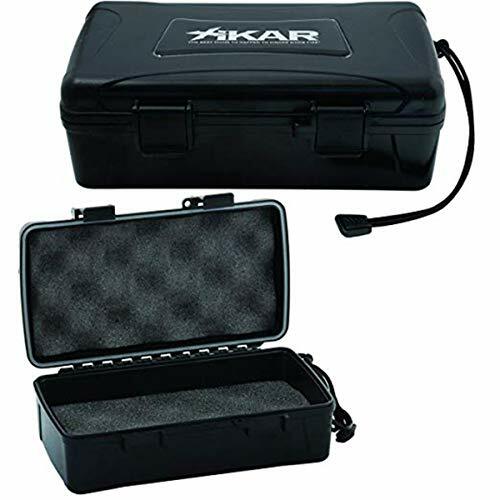 Xikar humidors come in a variety of sizes; they could be as small as a 5 cigar holder with the larger ones capacious of containing 80 sticks, the model we have chosen to review is a 15 cigar holding case. Xikar’s travel humidors are considered to be one of the top travel humidors because of its advanced security system featuring sturdy, long-lasting hinges and latches. You can also use the built-in molded lock to make sure no one else gets to your precious cigars without you knowing. Looking for something a bit more classy to carry your cigars in? 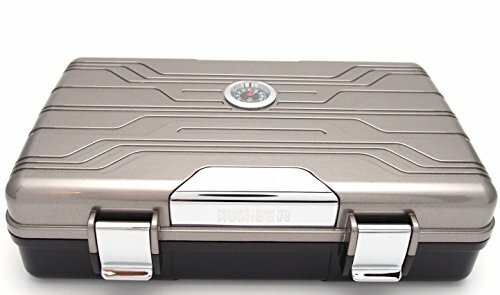 If you are longing for a travel humidor which goes beyond the function-we would recommend the Novelist Leather Book Travel Cigar Humidor from Prestige Imports Group; cloaked in a deluxe leather book jacket presenting a dazzling alternative to the myriad of hard plastic options that are commonly seen in the market. 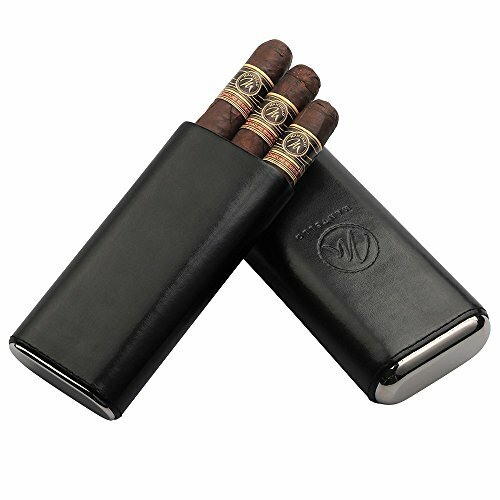 The Novelist leather cigar case has everything you require to bring out the best of your cigars. 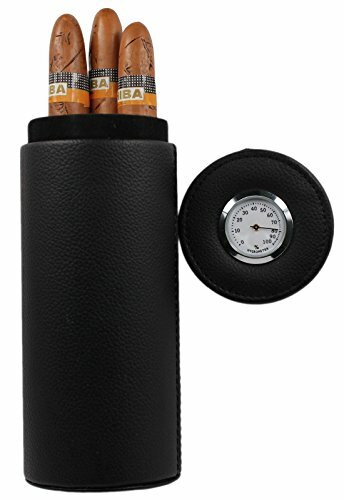 Perfected with the addition of a humidifier and a hygrometer, this is one of the best travel cigar case that keeps you posted on the humidity level. Another nifty inclusion we should mention is that of a guillotine cigar cutter which is firmly positioned by recessed magnets. The inside portion of the humidor has been lined with a cigar and contains a removable disc that can hold up to 5 clouds of smoke. Removing the disc would make room for 5 more cigars. Since the brand first hit the market in 2002, AMANCY has caught the eye of cigar lovers for its sleek designs. This model is a continuation of AMACY’s long line of elegant cigar humidors with a PU Leather exterior complemented by a cedar lined interior so that your cigars remain fresh and humid ignoring the adversity of the outside environment. The AMANCY Cedar Wood travel humidor simultaneously takes pride in its timeless design and stubborn build. Even though the polysynthetic leather skin won’t recreate the exact conveniences of original leather, it still poses an eye-catching demeanor and provides protection from normal spills and bruises. A hygrometer is favorably placed on top of the lid, allowing effortless observation of the humidity levels without having to crack open the lid. The humidor’s interior design consists of a cedar insulated wall and humidifier that can easily stock 5 standard sized cigars. Next, upon our best travel humidors list is Guardsman Travel Black Cigar Humidor. Constructed of reinforced high-quality ABS plastic, this humidor resembles the design of a vintage ammunition case, which may or may not be the reason this humidor is called Guardsman. This design should also add an extra appeal to you if you happen to have an interest in gun culture. 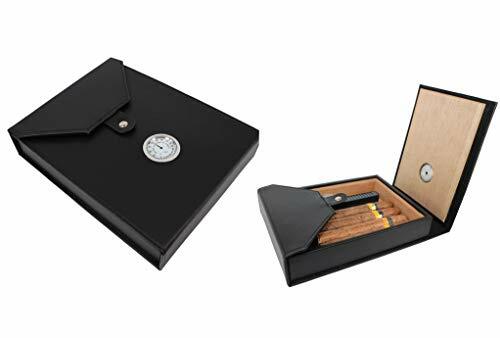 The humidor comes with a stainless steel hinge to foster portability and a silicone seal on the lid to ensure air and watertight storage for 10-15 cigars. You could also lock down the lid so that the cigars remain safe while traveling on rocky, uneven terrains. The humidifier disc is easily accessible and regulated so that you could maintain your desired level of moisture and humidity every time. Mrs.Brog travel cigar humidor is one of the top humidors for travel with a substantially powerful build. Crafted with high quality, long-lasting ABS plastic mold, this humidor is immune to external shocks and impacts; basically, it’s indestructible. Besides its resilient structure, the humidor would catch your eye with its stunning design and distinctive color palettes. On top of its hulking exterior, Mrs. Brog travel humidors interiors are adorned with foam cushioning and lined with a silicone seal. So, you would never have to worry about your cigars getting wasted even if you go through adverse weather conditions and withstand unfriendly natural surroundings. Whether you keep it in your travel bag or just stash it away somewhere in your house, your cigars will stay fresh and crispy. Built for the roughest outdoor adventures that come to mind, Mrs. Brog cigar travel humidors is a great option use for camping or trekking trips. The humidor is also water resistant which makes it usable in wet and rainy weather conditions. Just like the AMANCY travel humidor, we had discussed earlier in this article, this travel humidor from AMANCY is also brilliantly handcrafted using sophisticated Spanish cedar and PU Leather covering. Spanish cedar lining plays a vital role in maintaining the warranted humidity rate, and the polymerized leather coating safeguards the humidor from water and external shocks, making it an ideal choice for your cigar holster. This beautiful, envelope-shaped humidor can store 5-10 standard sized cigars and is conveniently compact in size. Alike its rivals, this model comes with a hygrometer etched right on top of its lid, which lets you monitor the humidity level of the humidor whenever you want. Cigar Caddy is a prominent name in the world of cigar accessories, and this mini travel humidor is a glorifying reminder of their standards. 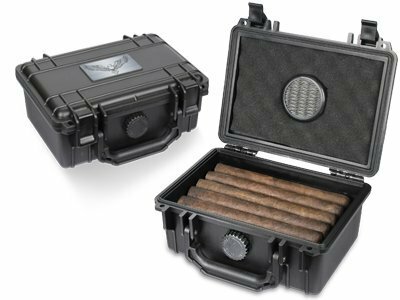 Cigar Caddy 3400 is for adventurers, who are more of an occasional type of smokers and are happy with a minuscule stock of 5 cigars only. Being small in size, this model is very easy to carry around. It has a sturdy ABS plastic made hard-body, airtight and waterproof up to 100 feet. The most noticeable aspect of this travel humidity is obviously its economical price tags. In a budget, this is one of the best travel cigar case you can buy. 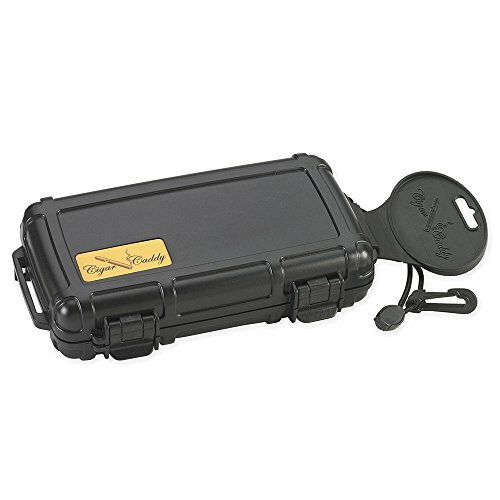 Speaking of small-sized travel humidors, Visol Products’ VCASE 453 “Little Joe” is definitely worth a mention. This cylindrical humidor is, in fact, one of the smallest humidor models you would come across, with a storing capacity of 1-4 cigars. It’s quite obvious that this model wouldn’t be of much use to those who prefer to maintain a larger smoking arsenal or for lengthy excursions but this could be a handy accessory for your daily commutes since it would easily fit into the pocket of your jacket or pants. In spite of being diminutive regarding size, “Little Joe” has a shiny stainless steel exterior to protect your cigars from external forces. Besides, it also comes with a hygrometer. This Mantello travel humidor takes pride in its exquisite leather casing which would not only keep your cigars fresh and lively but also serve as a glamorous piece of accessory that helps you emanate a consolidated fashion statement. The best thing we love about this model is its flexibility in size. You can quickly adjust the length of this case to accommodate your cigars better. The exterior ends are finished off with premium grade stainless steel while the interior is elegantly lined with Spanish cedar for better humidity control and persistence. 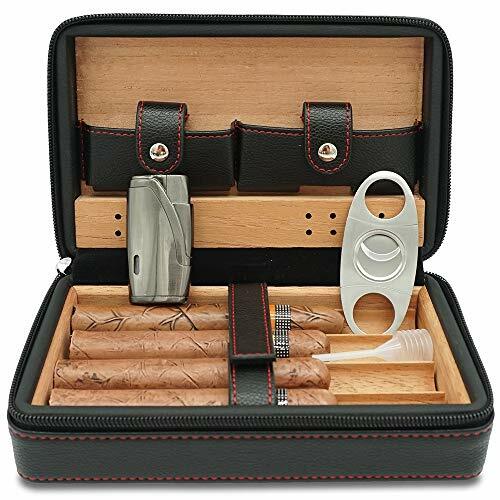 Scorch Torch travel cigar humidors have made it to our top travel humidors list because of its polished cherry finish and increased holding capacity that sees it carrying 10-24 cigar sticks horizontally. Scorch torch is a well-reputed brand, and their attention to detail, especially in this specific model is praiseworthy. The transparent plastic top adds an artistic touch to its look. The humidor comes complete with a hygrometer and humidifier. Scorch Torch travel cigar humidor falls in the least expensive range of the price spectrum, which is another plus point! The last but not the least of all inclusions are CiTree’s travel cigar humidor. With premium grade cigar casing enclosed with heavy-duty zippers, this model is quite a travel-friendly humidor indeed. 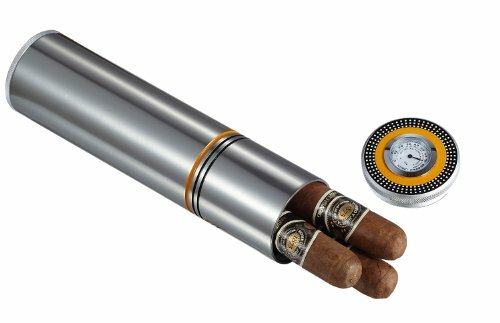 Just to beef up your cigar experience, this item comes with a jet flame lighter and a stainless steel cutter. The interior cedar wood panels ensure optimum storing condition for your cigars. The cigars are being separately held to eliminate the risk of damaging each other during travel. CiTree Cigar Humidor is a great choice for a beginner because of its ease of use. You can simply refill the humidifier with distilled water or humidor solution.